UPDATE JULY 22, 1992, BY ALEX. W. FRASER, RHODA ROSS. 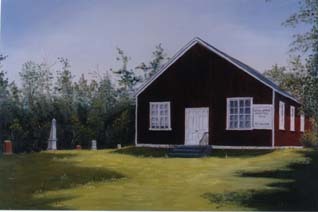 photo of Church taken by Rhoda Ross July 22, 1992 this painted done by her Jan. 2000. Brodie Church is situated about 1/2 miles east on the side road, 5th concession of lochiel on the south side of the road & to the east of the church. Inscriptions were copied starting at the row closest to the church from the north end, then proceeded from north to south, then reversed in a south to north direction in an "S" pattern, till the end of row 4. Walter J. 1884 - 1952 // Agnes MacEwan 1887 - 1938. Sacred // to the memory of // Jane Brodie // wife of // William Jamieson // died 25 January 1874 // aged 67 years.// Also of James S. Jamieson // died 18 January 1873 // aged 39 years. who die in the Lord"
Alexander J. MacEwan 1852 - 1930 // Ellen Jane Jamieson 1859 - 1923. Top broken off, [ rest in very bad shape, almost unreadable July 1992, awf. ] 1860 aged 84 yrs.// Agnes McKenzie ?// died Oct. 7 1870 //aged 95 yrs? James // Brodie // died // Oct. 14, 1883 // aged 83 yrs, // his wife // Annie Anderson // died // Jan 18. 1894 // aged 87 yrs.// Natives of // Scotland. Wiliam A. // Brodie,// died July 12, 1926, // aged 90 yrs. // Mary Smith // wife of // William A. // Brodie, // died Sept. 28, 1915 // aged 82 yrs. Mary B. // Brodie // died Apr 19, 1921 // aged 13 yrs. William F. // Brodie // 1871 - 1951. // Beloved wife // Elizabeth // A. MacEwan // 1884 - 1964. MCMEEKIN Henrietta McMeekin // 1919 - 1986 // Kathleen M. McMeekin // 1916 - _______ . James McMeekin // 1837 - 1926 // his wife // Elizabeth Jamieson // 1841 - 1917. Their children // Elizabeth // 1869 - 1947 //Robert // 1877 - 1893. William J. McMeekin 1871 - 1950 // his wife // Flora A. MacGillivray 1887 - 1972 // Their daughter // Margaret D. 1921 - 1924. Lillie M. Denovan // 1875 - 1925, // wife of // James J. Smith. In loving memory of // William Jamieson // died // Feb. 9. 1908 // ae. 79 yrs. // Janet Jamieson // died // May 3, 1915 // ae. 77 yrs. John Jamieson // died // Feb 9, 1908 // ae 78 yrs. // His wife // Catherine Duncan // died // Aug. 20, 1919 // ae. 82 yrs. In memory of // Thomas A Brodie // died Oct. 25, 1923 // aged 81 yrs. Simeon Johnson // 1874 - 1938 // beloved husband of // Ella B. MacEwan. south end of row 3. In memory of // Thomas Jamieson // 1861 - 1934 // William S. Jamieson // 1857 - 1937. In memory of // John Angus// Jamieson // 1868 - 1944 // his wife // Annabel Brodie // 1869 - 1944. In memory of Jennie M. Jamieson // 1909 - 1956 // Robert S. Jamieson // 1904 - 1963.